Property investment is one of the most important decisions and making sure that you pay attention to every bit of the home buying process is necessary. Searching for your dream home is definitely a tumultuous ride as you come across ads that you will find on social media, newspapers, TV or for that matter on radio. Although, finding homes is still an essential phenomenon, but the parameters of purchasing a new home in Navi Mumbai have not remained the same as earlier. This is collectively due to urbanization, shifts in family structures, spending patterns & many other factors. The new age buyers are redefining the norms of moving into a new home. Related to this, a study indicates that 65% of millennials aspire to buy a property in the future without compromising on the quality of life. Indian millennials consider renting out spaces as the best option rather than purchasing a new home. According to a survey carried out By the world’s largest real estate consulting group, CBRE Group Inc, indicates that 82% of Indian Millennials live with their parents and 25% of these have no intention of leaving the family home and 25% of Indian Millennials have no intention of leaving the family home. Digital savviness and millennials go hand-in-hand as they are the first generation to have access to internet right from their adolescence. This generation of audience is more inclined towards technology and the Internet. Right from shopping to searching homes, Millennials are more influenced by visiting social media & other websites when they want to invest in a property. The use online resources are not just limited to search of new homes, even when calculating mortgage costs or getting loan approvals, Millennials chose the internet medium. The generation seeks transparency when buying new homes. While researching for homes, they always prefer to do 80% of inspection themselves as they value transparency rather than risking in half-knowledge information. They believe in being 100% sure that their investment has proper returns. 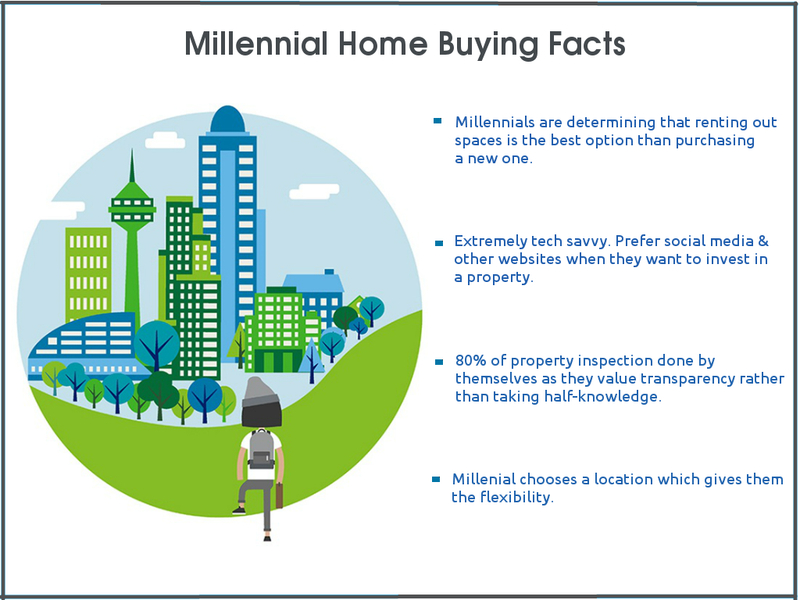 When buying a new home, millennials consider choosing a location, which gives them the flexibility to be close to their workplace. In addition, this indicates that convenience is an utmost priority for the crowd as it allows them to spare time engaging in social activities at large. The trend of home buying strategies among millennials is changing, which means real estate developers in India would have to use new marketing methods to reach new prospects. If you’re looking out for luxury properties in Navi Mumbai, visit our website. This entry was posted in Investment Advisory and tagged Buy property in Navi Mumbai, Home Buying Facts, luxury properties in navi mumbai, Millennial trends, New age buyers, New Home in Navi Mumbai, property investment on August 8, 2017 by akshay.